Congratulations! You win 76 bonus points with this purchase! PureVision Toric continuous silicone-hydrogel contact lenses correct astigmatism and promote high quality vision. They’re the most popular toric lenses on the market and should be replaced monthly. Users of the PureVision Toric contacts can start using the new PureVision 2 for Astigmatism lenses without a new prescription. Is it possible to trial the lenses at a cost? 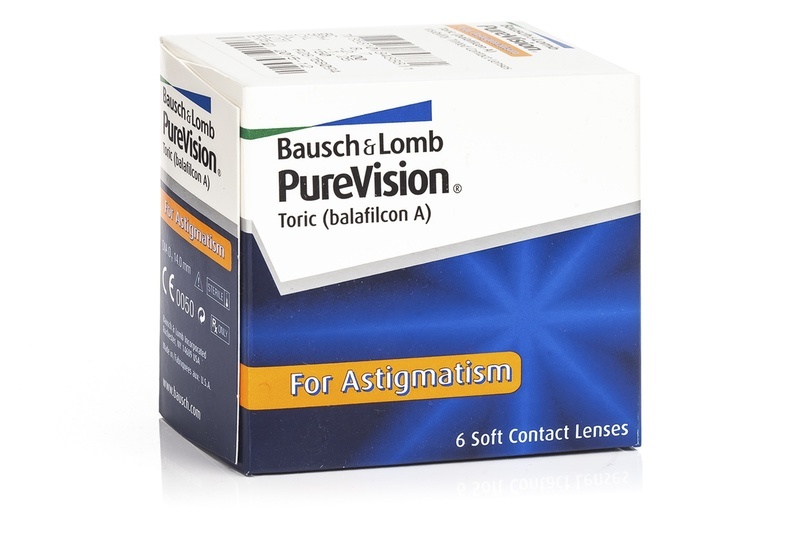 My contacts at present are BC 8.9 and seem to move around if I go with the PureVision Toric the BC IS 8.7 will this help or make things worst? In order to purchase contact lenses, you need to have them prescribed by your optician. The BC is an important parameter and I suggest that you consult with your eye doctor who will measure the BC of your eyes properly. After that, you can place your order for the correct contacts. At present I wear Purevision2, I put them in at the beginning of the month and take them out 3/4weeks later. Is there any difference with Pure Vision Toric? As explained below, you can sleep with these lenses as they are designed for extended wear. According to the manufacturer's re­commendations, the lenses should be left for a night in a solution for disinfection once a week. No, you don't have to take out these lenses every evening. They do provide extended wear. Dear Elaine. Thank you so much for your message. Yes the lenses are monthly lenses. But you will need to take out the lenses each evening before going to bed and put them in a case with a solution. You will find all our solutions on the website here: https://www.lentiamo.co.uk/solutions.html I hope this could help and please do not hesitate to contact me again If you require any further information. Have a nice day.